Losing an important photo on your smartphone can be a devastating event – whether it was done accidentally or the result of a device issue. An accidental tap or an even more catastrophic event creates the need for a straightforward recovery tool. These utilities are the best choice when you quickly need to regain lost or deleted memories from a smartphone. 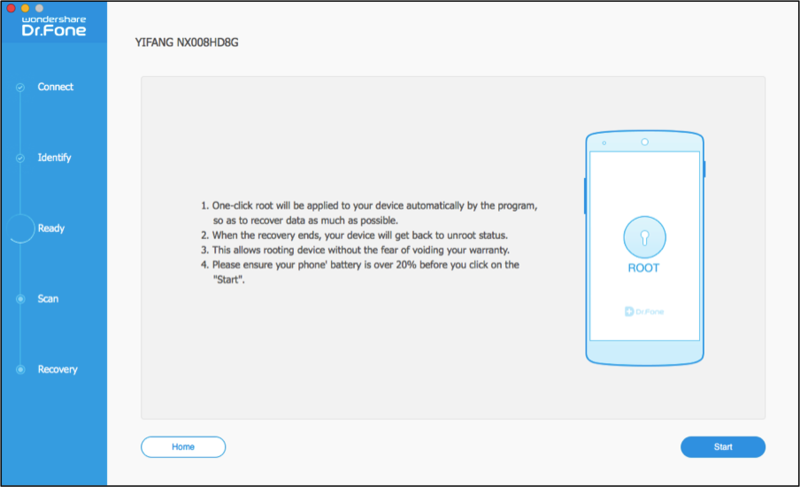 Dr.Fone for Android is one of the first recovery tools designed to help users retrieve images and other data straight from their Samsung Galaxy Note 2 or 3 smartphone. A recovery tool scans storage to locate any item that may not be visible to the operating system, but remains in the physical location. For example, if you delete a document from the phone, it remains in storage until new data is saved to the location. This creates a window of opportunity for you to retrieve deleted images without losing them forever. With Dr.Fone, it is a simple task to locate missing or removed photos and quickly save them to a designated spot on your computer. Dr.Fone for Android is able to help you on how to recover photos from a Samsung Galaxy Note 2 & 3 as well as other models. The utility offers additional options for recovering other forms of data such as videos or contacts. It also makes the preview and selection process a simple task. Whether you need to quickly restore one image or many, Dr.Fone provides a quick fix for the problem! Next, connect the Samsung Galaxy Note 2 or 3 to the computer where Dr.Fone has been installed. Then enable USB Debugging on the phone by following the examples provided by the utility. Be certain to click on the right operating system version for your smartphone! The utility will then identify the device and begin the tasks for recovery. Please wait patiently for the identification process to finish. You are now ready to begin the recovery! For this tutorial, we will be showing how to recover deleted images on a Samsung Galaxy Note 2 or 3 using a Mac computer. However, you can follow the same steps when using a Windows install. Step 1: Check the Gallery Option. When the phone has been identified by the utility, you will be presented with file type options for the recovery. Dr.Fone instantly checks every item to make salvaging everything on the phone easy. The first step involves removing the checkmark from every item on the screen other than Gallery. This informs Dr.Fone to only search for photos during the scan. When finished, you will need to click on the Next button to advance to Step 2. Step 2: Complete the Recovery Mode Configuration. Some file types like photos include multiple recovery mode options. With Dr.Fone, it is possible to recover only deleted images, all images, or to complete an advanced scan. 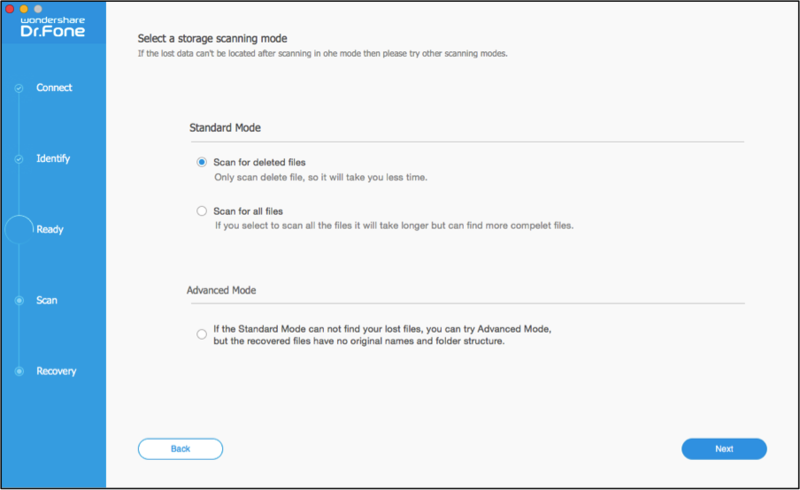 For this tutorial, you will need to select the radial next to Scan for Deleted Files underneath the Standard Recovery Mode section and then click on Next. Step 3: Locate Photos for Recovery. Before a scan starts, you will need to click on Start to allow Dr.Fone to complete the required device verification steps. It will spend a few moments verifying the Galaxy Note 2 or 3 and performing further tasks to prepare for scanning. After this has completed, the utility will begin searching for recoverable images on the phone. You can view the current progress at the top or click on Gallery in the left panel to see found items. Step 4: Choose the Images. When recovering images, you may either salvage everything found by the program or select what will be restored. Everything is checked by default, as shown by the checkmark next to Gallery in the left panel. Dr.Fone selects every image found by the scan for recovery and you may retrieve every photo by clicking on the Recover button. For custom selections, first uncheck the box next to Gallery and then click on it to view the photos on the right side of the utility. If the check is not removed from Gallery, every item will remain selected for the recovery. You may also leave this checked and simply uncheck any photos that should not be retrieved from the phone. Change the view by using one of the provided buttons in the upper right of the window. Dr.Fone defaults to a thumbnail view for images; however, a list view option is provided as well. Simply click on one of the buttons to change the view. Photos are selected by clicking on the thumbnail or the checkbox when in list view. Any item with a check is currently configured to be included for recovery. You may also type a text/s into the search field to find a specific image or any images containing the text. Make all desired photo selections before continuing to Step 5. Step 5: Salvage Your Gallery Photos. Do not forget to click on the Recover button! The photos will not be recovered until you have performed this final step and configure a save directory. Once finished, simply wait for Dr.Fone to save the files to the designated location on the computer. Complete the Recovery Mode Configuration.